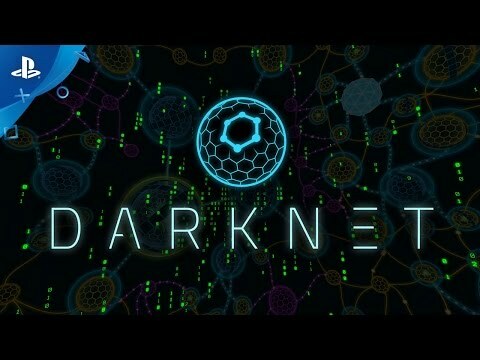 Darknet is a cyberpunk puzzle/strategy game presented in a vivid, immersive first-person perspective. Winning requires careful planning and smart execution, and only the most skilled hackers will unlock the deepest secrets at the heart of the web. Your PS VR headset becomes your virtual window to a hidden cyber world. Conquer the underground webspace by diving directly into networks for an up-close-and-personal hacking experience. Using worms, viruses, and exploits, it's a race against the clock to infiltrate the network before time runs out...or your signal is traced. Procedural level generation means that no two networks are alike. Test your skills against increasingly difficult challenges, or try to beat your best times in networks you've already conquered. Darknet's clever gameplay goes much deeper than what you see. Observant players will discover hidden details that will elevate their hacking to the next level. Dive into this cyberspace simulation as an elite hacker contracted to retrieve hidden data from increasingly advanced networks. Uncover the net's deepest secrets by dropping viruses, cracking nodes, and collecting data, all while staying one step ahead of security. From suspicious megacorporations to shadowy organizations, no one's data is safe as you hack your way to the darkest corners of the net.